Apple’s iPhone OS 3.0 event, mentioned in the previous post, has drawn to a close. The media event, held at Apple headquarters in Cupertino, was an advanced preview of the upcoming iPhone 3.0 firmware that will be released “this summer." As of today, Apple is making a beta version of the new firmware available to developers so that they can begin utilizing the new features it brings. And those features are many. Prior to the event, Apple asked several developers to spend two weeks with the beta firmware and produce applications that showcase some of the new capabilities. A number of applications were demonstrated but, of course, Touch Arcade readers will be most interested in how the 3.0 OS will improve gaming on the device, and so I’ll focus on the game demonstration’s from today’s event. Apple’s Greg Jos introduced a short film piece that takes a look at Steve Demeter, author of Trism [App Store], one of the early App Store successes. 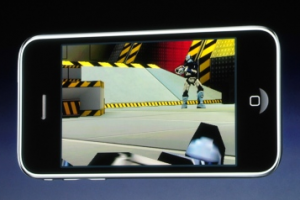 The piece points out that Steve developed Trism entirely outside his dayjob and the game’s success allowed him to transition to full-time iPhone development. 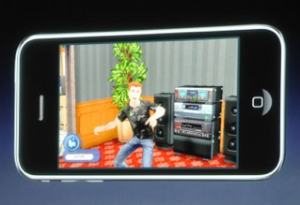 Travis Boatman from Electronic Arts took the stage to demonstrate the company’s forthcoming iPhone version of The Sims 3. 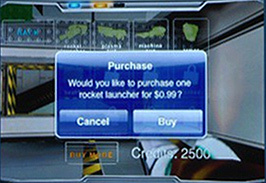 The game demonstrated the 3.0 OS support of in-game purchasing. Boatman bought several items through an in-game store system for the Sims at a price of $0.99 each. The title also showed off 3.0’s iPod library access capabilities by having a Sim turn on his in-game stereo and play back music directly from the unit’s onboard music library. Ngmoco’s Neil Young took the stage and discussed the company’s upcoming titles Touch Pets, the electronic pet simulator, and LiveFire, a first person shooter with 3G and WiFi multiplayer support. Touch Pets was used to demonstrate 3.0’s new push notification system. An onscreen notification was shown of a requested “play date" with someone else’s dog. In-game purchasing of doggie sweaters, hats, bones, and the like was also shown. Apple shared a few statistics with the crowd during today’s presentation, as well. Forestall indicated that, through December 2008, 17 million iPhone were sold. Adding iPod touch sales to the mix brings the number sold up to 30 million devices. The free iPhone SDK has been downloaded over 800,000 times and over 50,000 companies and individuals have signed on to Apple’s development program–over 60% of them having never developed anything for an Apple platform previously. Forestall also indicated that the 25,000 applications currently in the store represent 96% of all apps that have been submitted, and that 98% of those were approved in a week or less. The iPhone is an amazing success for Apple. The company exceeded their target 2008 sales figures and has the most versatile and elegant mobile / smartphone on the market. iPhone 3.0 greatly expands the unit’s capabilities and should bring a wave of applications that exploit the iPhone’s capabilities on a whole new level–and among those applications, of course, are games. 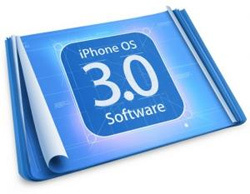 Apple will be releasing the iPhone OS 3.0 upgrade this summer, free to all iPhone owners. The iPod touch upgrade will be available at a cost of $9.95.